BEREY - Patrimoine St Pierre et Florentin. BEREY,N. - Patrimoine St Pierre et Florentin. Patrimoine St Pierre et Florentin. - BEREY,N. Title : Patrimoine St Pierre et Florentin.. Size : 13.7 x 18.9 inches. / 34.8 x 48.1 cm. 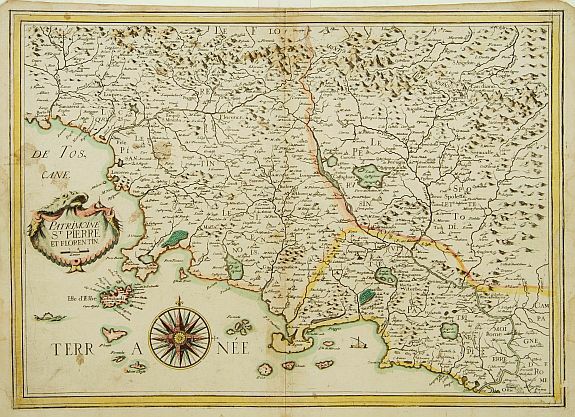 Description :A rare map Centred on the province of Florence. Very decorative title cartouche on the lower left-hand corner. Condition : Good impression. Map slightly age-toned, and marginal water staining. Good condition.